Tattered and Inked: Christmas 2011 Mantle Reveal!!! 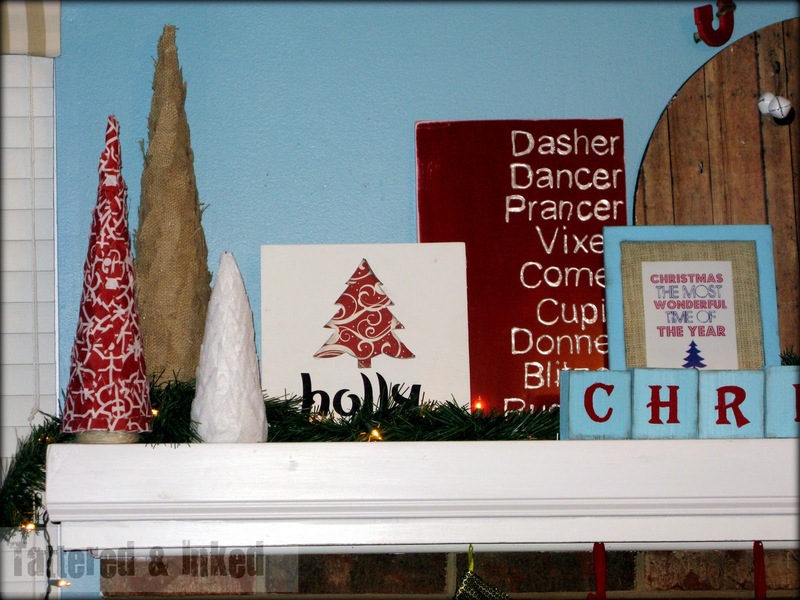 So do you think I'm a total nerd if I admit that decorating my mantle is my favorite part about decorating for each season?? Hubby about had a heart attack when I started pulling all our christmas decor boxes and sifting through them. but I like to look at everything that has...potential...before deciding on a set plan. Last year's mantle was pretty but was my very first attempt at really trying to deck it all out. I think I've learned a thing or two this time around so I'm super excited about showing it to you! 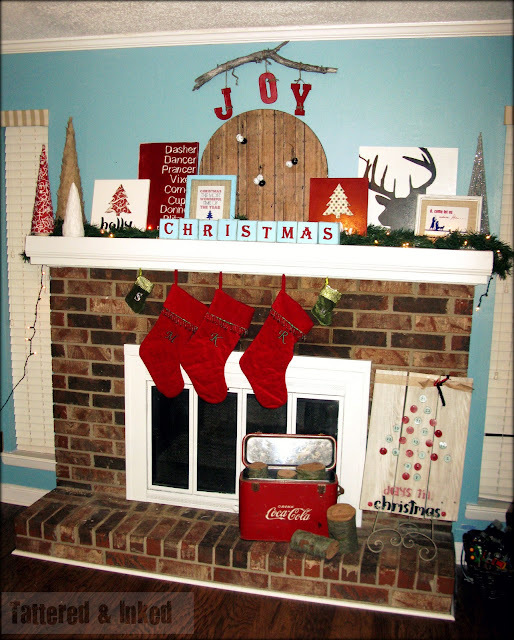 Not to mention that the little fireplace update we did not long ago looks soooo amazing with all the christmas colors. That's gotta be one of my most favorite spraypaint redos ever. I figure I'll show you the reveal and then the rest of the week I'll be breaking it down to show you some of the fun projects I did for it. 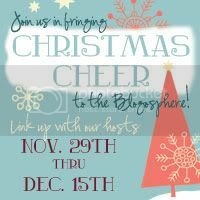 So are you ready for me to stop talking and start showing you christmas eye candy pics?? 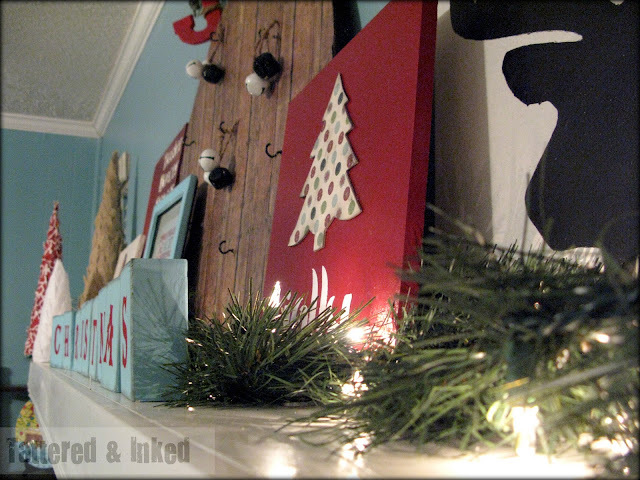 There's just something about Christmas colors and decor that bring your spirits up,huh? You'll be seeing tutorials on nearly everything up there later in the week. I've already shown you guys my reindeer names sign. 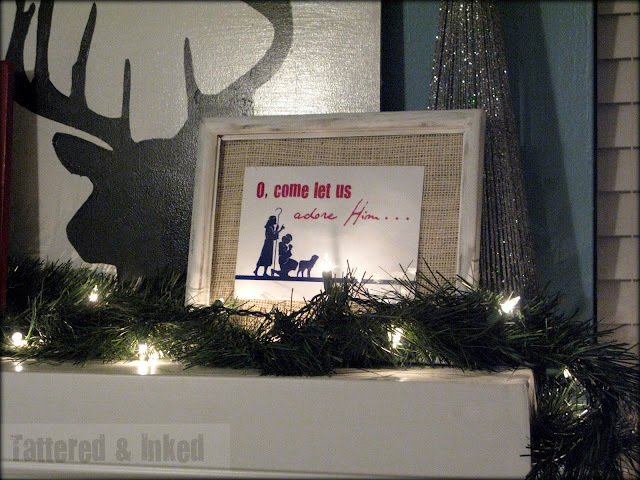 And I love it's special place up on the mantle! But I'm in love with my reindeer silhouette painting. It may have been my favorite thing I made up there. 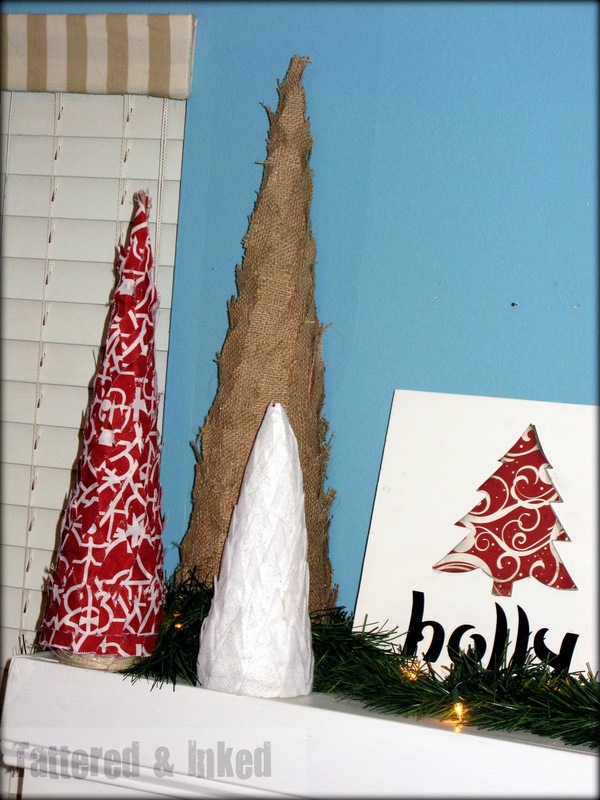 Aren't christmas trees so fun to make? I"ve loved seeing all the tutorials out in blogland for them and this is my fabric version. 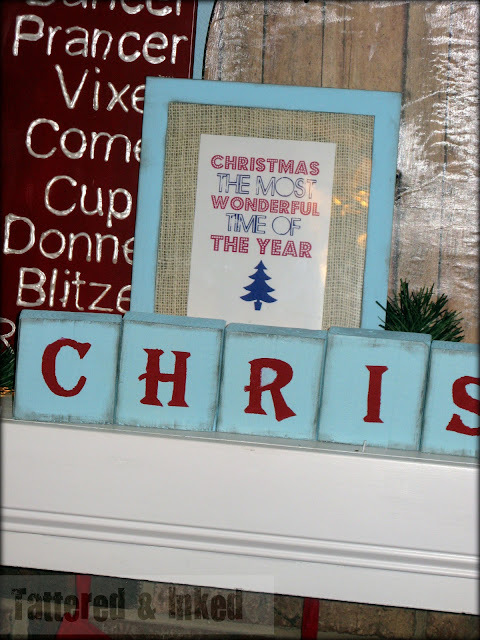 I've already shared the free "Most wonderful time of the year" print with you and you can find that here. I printed it as a 5x7 and glued it to some burlap to be framed. 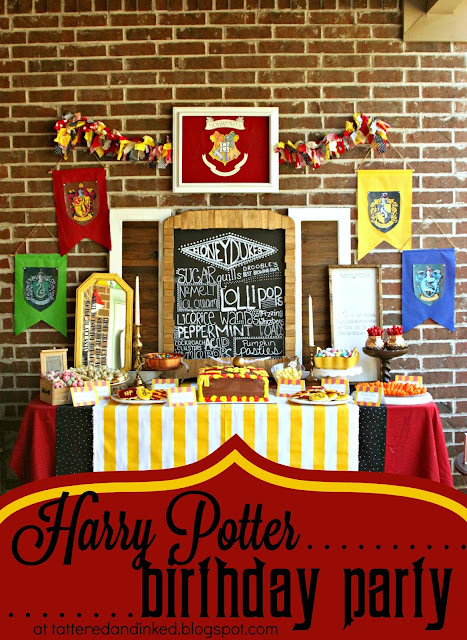 This printable is found here and is my favorite. This is so neat because it belonged to my grandfather. My dad found it when he was cleaning out my grandmothers house after she passed away. It's such a beautiful vintage cooler and he graciously let me 'borrow' it to use for Christmas. I love that it's such an awesome antique but has a family history too. Makes it 10 times more special. And those aren't just any random wood logs. My parents recently had to cut down a tree in their backyard that they had spent forever getting to grow. It was really sad to see it get knocked down for their new renovations but I insisted on keeping some of the cuttings for random things. This was my little sneak-peek I showed you on my facebook page last night. I think I've definitely improved a little since last year, don't you? 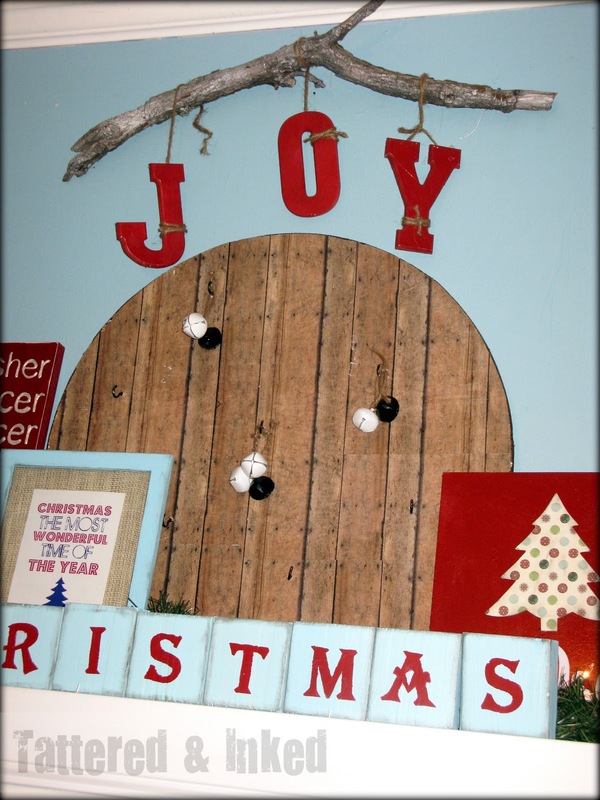 What's your favorite part about decorating for the Christmas season? This week is going to be a crazy week for me in school. It's our last week before finals and is crunch time in a lot of my classes. and several other humungo projects in the works. Only a couple weeks left until Christmas day, can you believe it?? 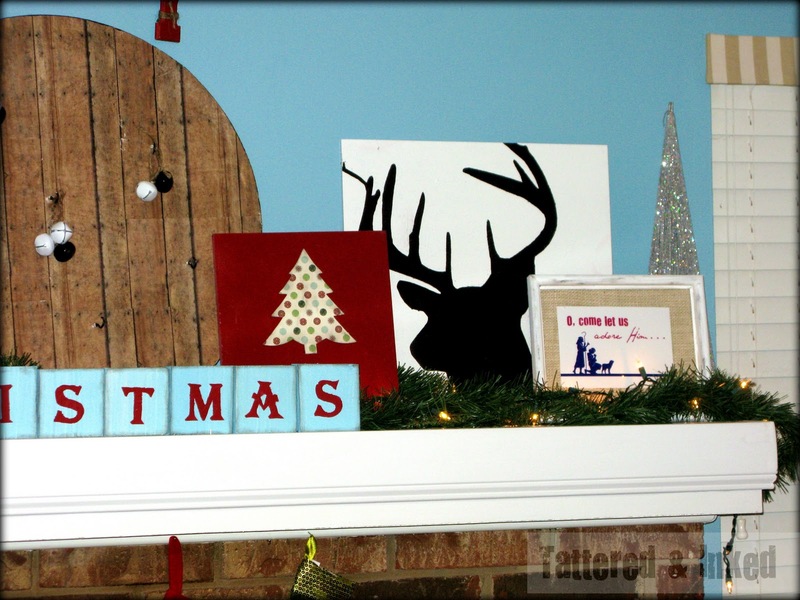 Yes the mantel is the focal point of everything!!! 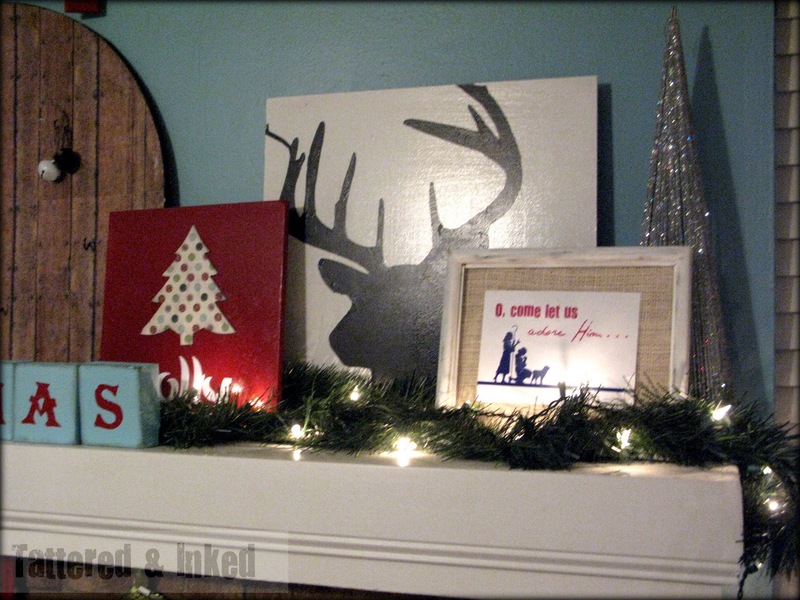 I wish I had a mantel to decorate. I love everything you did here!!! Wow!!! I LOVE it!!! just WOW!! It turned out soooo good!! Now I have to do something to mine, lol! Kelsey I love your mantel. Its beautiful. I love that you made everything on it and I love the colors. Very very nice. I couldnt even tell you my fave part...Love it all! Super sweet adn cute fireplace. just perfect. 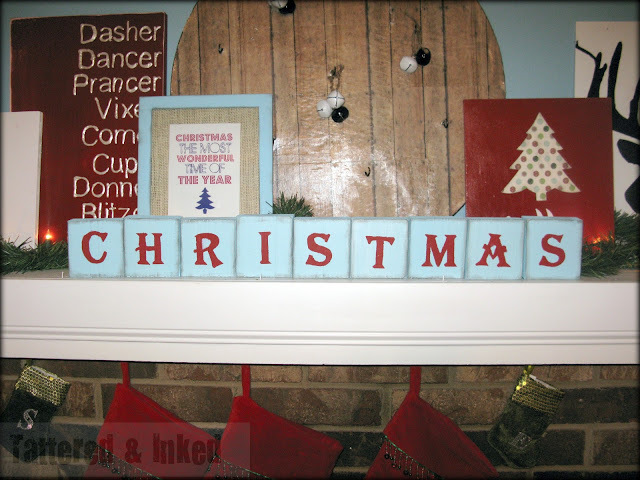 Your mantel is just perfect! I love the colors you used.. So lovely! I love the red on blue~the blocks are sweet, the reindeer silhouette is awesome(you are right~so random and so perfect)...every little detail is so retro and yet so hip! Very fun and cheery. The colors and details look great!! 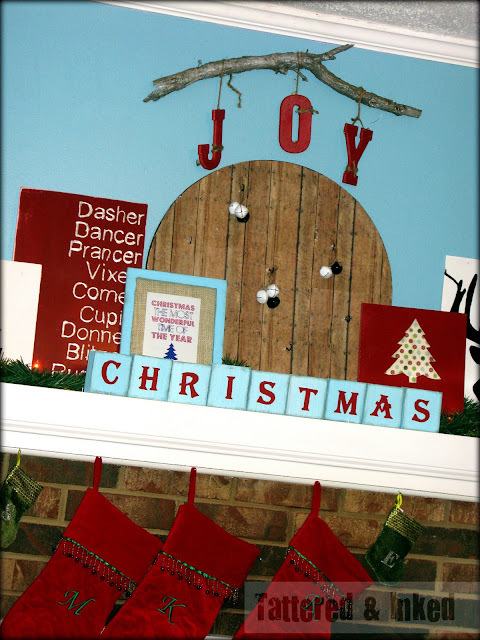 I especially love the word "JOY" hung on the branch...so unique! 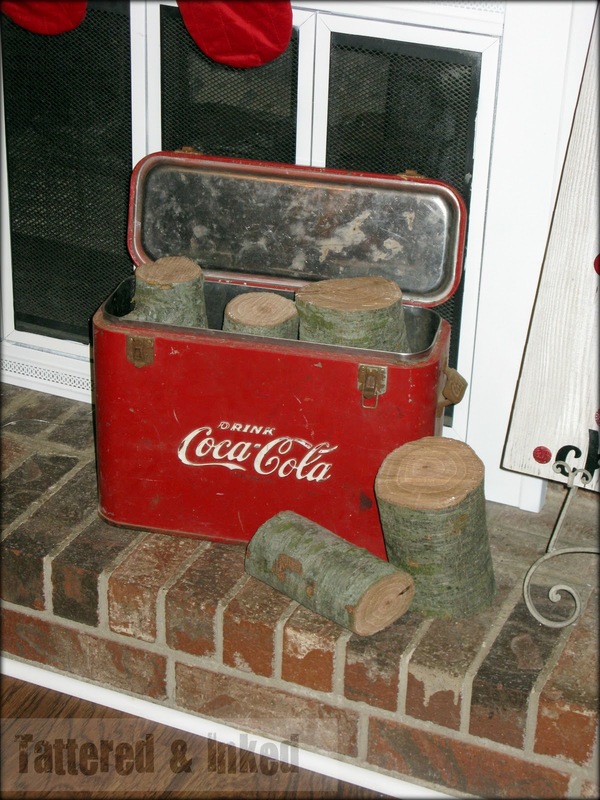 And the logs in the Coca Cola bin is so neat! 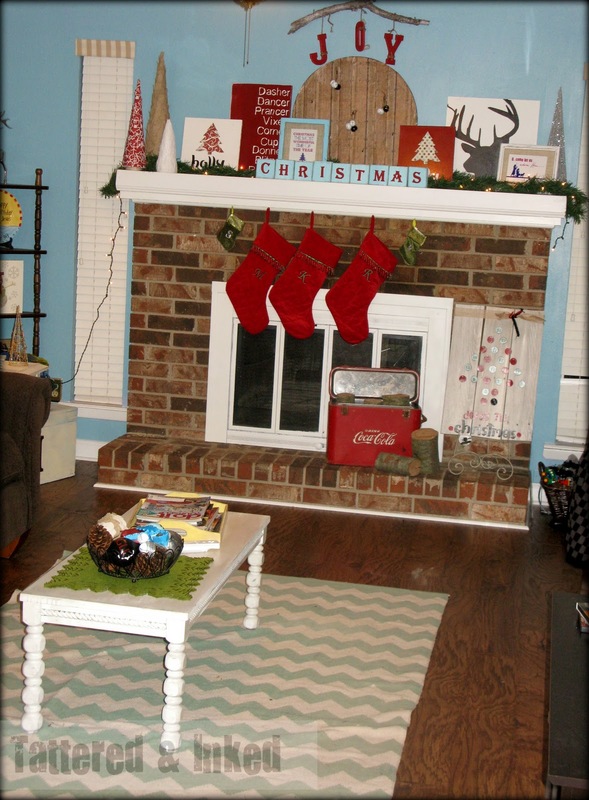 love all the layering on this mantel, not to mention the fun color combo. great new/old coke tin, how special! teal with a dash of red has been my color obsession this whole year, especially for winter! i love all the personal meaning many of your pieces hold, it looks lovely! the Christmas decorating has fallen by the wayside and I'm just getting around to it. Anyway, I have a question for you? What is the tree beside the cocacola cooler? It looks like it's made from bottle caps? We have a ton of bottle caps and I would love to do something like this with my kids.